Joelle Hasilo always knew she wanted to be a mother. So when she found out she was having twins she was beyond excited. And then her water broke 28 days early. “It was exactly like the movies,” she says. “I got up off the couch and then it was ‘swoosh’. 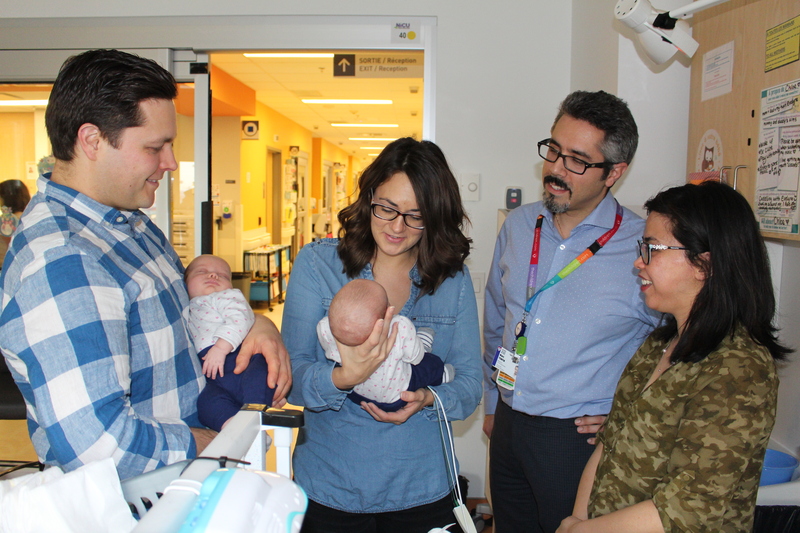 It all started to feel very real in that moment.” She was rushed to the Royal Victoria Hospital (RVH) of the MUHC where she underwent an emergency c-section because both babies were breeched. Evelyne and Chloe were born two minutes apart on September 24, 2017. Since Joelle had just undergone surgery, her husband, Craig, was brought in to meet the twins first. 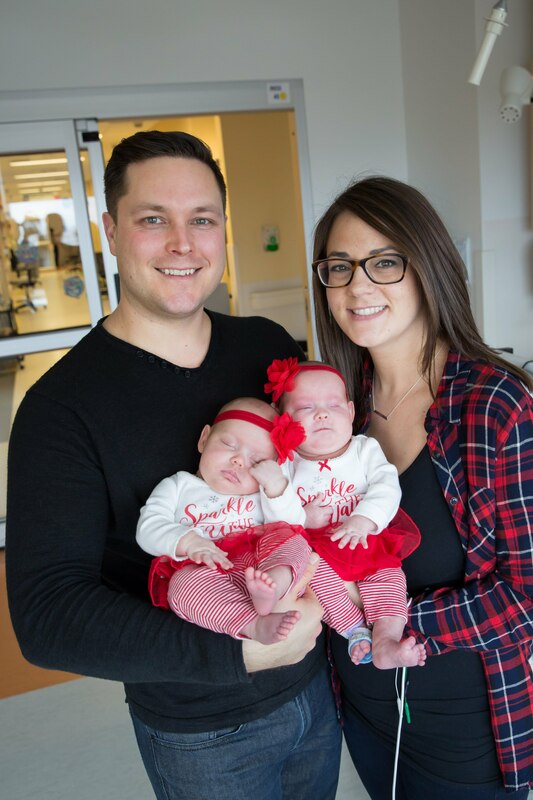 Doctors informed him that they were having a hard time suctioning Chloe’s nose and the twins were rushed to the Neonatal Intensive Care Unit at the Montreal Children’s Hospital. The next day, Chloe was sent for a CT scan which confirmed that she was in fact missing an eye. Because her left eye never developed, her septum curved too much to the left causing the blockage of both nasal passages. “It was a critical and urgent issue, because she couldn’t breathe out of her nose and therefore couldn’t eat,” explains Craig. Doctors introduced an oral airway to help her breathe through her mouth while they waited for her to grow. She needed to weigh close to five pounds in order to have her first surgery. Joelle and Craig then met with the Medical Genetics team to rule out any genetic disorders, and had consultations with Otorhinolaryngology (ENT) and Ophthalmology. “Eventually we’ll look into fitting Chloe for a prosthetic eye, but the more pressing issue is her airway problem,” explains Craig. Chloe was screened for various syndromes and underwent a series of genetic tests. “Doctors had never seen anything like this,” he says. “Sometimes babies are born with one of these issues, but never both at the same time.” All the genetic tests came back negative—Chloe was simply born with two major, unrelated anomalies. Her eye condition is known as Anophthalmia and her airway problem is called Bilateral Choanal Atresia. At three weeks old, Chloe underwent her first surgery. The ENT team at the Children’s wanted to open up the right nasal passage to give her an airway. The surgery was successful and she started to bottle feed. Her sister, Evelyne, was discharged from the NICU the next day. “Bringing Evelyne home was such a bittersweet moment. I was so happy, but at the same time so sad that Chloe couldn’t go home with her,” says Joelle. Performing a third, similar surgery was not an option. 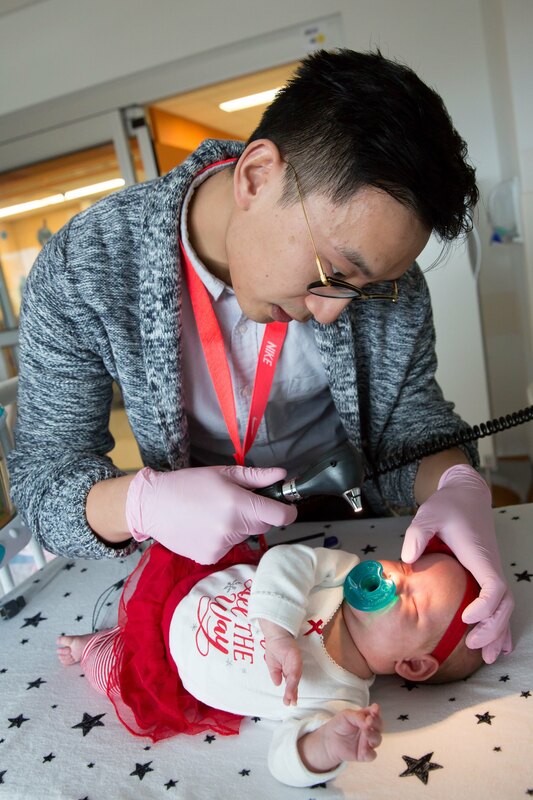 At this point, Dr. Lily Nguyen, a pediatric head and neck surgeon in Otolaryngology at the Children’s, got involved and decided to ask for help. She contacted Dr. Marc Tewfik, an ENT surgeon from the RVH. Last May, Dr. Tewfik became the first surgeon in North America to use a new augmented-reality technology, called Target Guided Surgery. There are a lot of danger zones when performing ENT surgeries due to the close proximity of the brain and eyes. This new technology allows surgeons to come up with a surgical roadmap that helps guide their instruments during surgery and alerts them if they veer off course. Dr. Nguyen and Dr. Tewfik discussed the possibility of using it to help Chloe, making her the youngest patient to ever undergo such a surgery at the MUHC. “It took us several days to come up with a plan, because we had never worked with such a young patient,” says Dr. Tewfik. “I reached out to some of my colleagues for advice. Chloe is so small so I had to go through all of my equipment to pick out the smallest instruments because everything I have is adult-sized. Her nostrils were barely big enough to get the scope in.” On November 12, eight OR personnel from the Children’s and three from the RVH performed the surgery. “It was a real success,” says Dr. Nguyen. As an extra precaution and because of her size, the ENT team also decided to insert a stent to help hold her septum in place as she healed. “Because of the stent, we had to suction every three hours to make sure her airways were clear enough to feed,” says Joelle.